You know what they call The Hunger Games in Paris? Battle Royale with cheese! I’m not going to come out like one of the haters and go on a negative rant about The Hunger Games. Truthfully, I want to see The Hunger Games as it looks to be rather entertaining, and it’s hard not to see that it’s making a bigger impression on mainstream cinema than Battle Royale did. However, there are things that are incredibly obvious in this world (one of which being the fact that Han shot first) and the fact that Battle Royale was released shortly before the book The Hunger Games makes it somewhat evident that there was at least some influence. Anchor Bay obviously sees the similarities as well because Battle Royale comes to Blu-ray just in time to welcome The Hunger Games to theaters, and it does so in “The Complete Collection.” The four-disc set includes the Director’s Cut, the Theatrical Cut, Battle Royale II: Requiem, and a fourth disc full of extra features. A massive set, indeed, as Anchor Bay knew the fans would be swarming due to the fact this is the first major North American release of this international hit. The concept of Battle Royale is simple, the government has lost control due to a collapsing economy, children no longer fear authority and have become constant nuisances, and discipline has become crazy harsh. Mixing those all together you get the B.R. Act, a government mandated law that takes one middle school class a year, puts them on a deserted island, and makes them fight to the death until only one is left standing. This specific go around is a class of forty (and two “exchange students”) that play hooky when they feel like it, abuse the teachers, and incidentally have quite a few mommy and daddy issues. The group, however, as bad as they seem, are still children; and once they’ve had the rules of the game explained to them, they show their many ways of coping with the twisted world they’ve just been pushed into. Battle Royale is interesting in that it offers quite a bit more than just a gore fest. The plot digs deep into what it is to be many of these children and what caused them to become the delinquents they are. Ultimately their bad behavior was a result of abuse, neglect, and mistreatment by the very adults in this fictional society that can no longer handle the youth. The idea that these kids have no filter and are desensitized is the very result of what the adults are putting them through. Irony? Depends if you’re Alanis Morissette or not. However, it is a clear look at what truly happens in today’s society when adults continue to blame everything else for the corruption of our children and society beyond their inability to censor or care for. 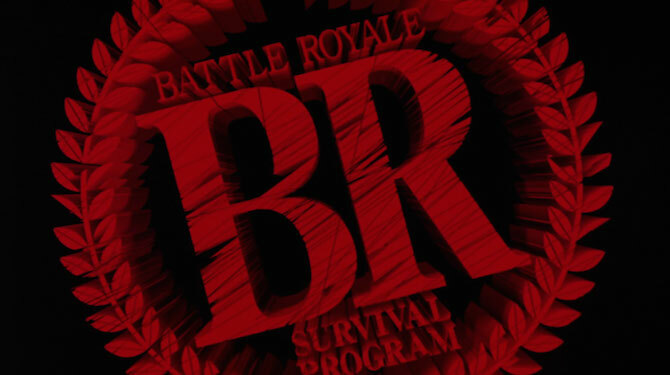 Beyond the plot message, Battle Royale is a solid movie. The acting is impressive for a group of teens, and the team behind the scenes does a rather impressive job with sets, effects, and costumes. There are two cuts of the film, with the Director’s Cut being less than ten minutes longer than the original version. The change in discs won’t change the ending or even change the road there very much. With the extended version, you do get a few extra flashback scenes and a bit more gore. Whether it works or not is up to the individual. Knowing quite a bit about Battle Royale, I had no prior knowledge of the sequel, Battle Royale II: Requiem, and its do it all over again with a few minor twists to the formula. No matter how you feel about Battle Royale, whether it’s just pointless violence or a well contrived story, Battle Royale II: Requiem is a movie that simply does whatever it can to benefit from the success of its predecessor. There’s no originality here, no great ideas that make it clear a sequel was needed. Just a basic do-over with a few twists that make the students’ lives a bit more difficult. Instead of one survivor, the students are paired up with co-ed partners and must keep in close proximity and protect each other. Any separation of the pairs, via distance or death, means those wonderful necklaces they were supplied with will get a bit crazy. Beyond that, it’s nearly the same concept. We have forty-two students, this time from different classes, picked and put on an island in the same manner. The end result for these kids isn’t the same though as it’s more of a fight just because and not due to the deep rooted issues the first Battle Royale presented. Even more so, the craziness of Asian cinema comes through even greater in this film as the clear attempt to present more gore and violence is there. Battle Royale II: Requiem isn’t a total mess as it does have a more entertainment value than some of the terrible sequels we’ve seen from California. In the end, however, it is quite clear that we could have done with just one Battle Royale and avoided the greedy cash-in that powered the sequel. When you really break it all down, it’s amazing what mainstream cinema can borrow from and still pass off as acceptable for kids. Battle Royale (both cuts) and Battle Royale II: Requiem are absolutely not suitable for children, and the fact that The Hunger Games is borrowing this concept for a young adult audience is more than interesting. Either way, Battle Royale is a must see film with plenty of violence and plenty of plot undertones. There’s no reason to sit idly by and miss out on a coveted piece of cinema that is influencing a cultural icon. Battle Royale: The Complete Collection has plenty of things going for it, unfortunately its Anchor Bay release isn’t one of them. The video is pretty average with plenty of issues coming across on all three Blu-ray discs. The audio, however, is impressive and does save the presentation from being a total disaster. Battle Royale is presented in full 1080p courtesy of an Mpeg-4 encode. The presentation for the Director’s Cut (Disc 1) and Theatrical Cut (Disc 2) are identical, as there’s only a difference in a few scenes between the two versions of the movie. The movie doesn’t look like it was treated great from the get-go and that is playing a lasting effect on the source. The picture is muddy, blurry and flat with occasional strong points. Colors do look the best; at least greens do with the island being a beautiful wasteland of destruction. Flesh tones do hold for the most part, but can seem off at times. Detail is where the movie starts to have issues, with some scenes having no detail at all and others holding fair amounts. Backgrounds suffer more than characters and weapons as they are somewhat mistreated. The mix of shots that have issues with blurriness and softness are tremendous as those ugly scenes pop up quite often. Overall, the image is clear enough to say its worthy at its price but I was kind of hoping for an epic release due to the attention this set was getting. Also presented in 1080p via an Mpeg-4 encode is a slightly better looking Battle Royale II: Requiem. Production value and quality of equipment was an upgrade thanks to the success of the first movie. Those upgrades transfer directly over to the high definition release as Battle Royale II: Requiem has some better colors and quite a bit more detail. The image is still muddy and soft at times, keeping this from being a great presentation but the picture does do a better job on more colors and flesh tones as well as offering a bit more detail in backgrounds and scene props. Overall, a slight upgrade but still a lackluster video presentation on the third disc. The Japanese Dolby TrueHD 7.1 on Battle Royale: Director’s Cut and Theatrical Cut are magnificent. Both the Director’s Cut and the Theatrical Release are exactly the same in terms of sound, with the tracks being identical mixes and the Director’s Cut just seeing a few extra scenes. Sound effects aren’t very natural but that’s really the only thing holding back this track, as there are plenty of other positives for this track, including the dynamic tones in the music. Music really does set the stage for this movie; it’s overly dramatic and even peculiar at times. The surround track replicates that music across all the speakers and does so in a very clear fashion. Dialogue is also top notch here, as the Japanese track has a very clear and audible center channel mix with conversations coming off plain as day. Sound effects sound cheap and off at times but that most likely relates to the recording itself and not the improvements made for a high definition release. This track is awesome and helps make the experience. The sequel still offers a lossless track, but it’s a Japanese Dolby TrueHD 5.1 track as opposed to a 7.1 mix. It’s as equally impressive in every way that Battle Royale’s track is. Conversations are crisp and clear with all the Japanese dialogue coming through the center channel uninterrupted. The sound effects and music play out nicely and also help define the movie. Music is broadcasted across all speakers and sounds as impressive as the first movies’ mix. Sound effects sound more natural than they do in the first and the speakers continue to do a good job with those. Overall, nobody will be disappointed with the audio tracks on board as they are significantly better than the video presentations. The extra features are extensive on this Blu-ray release of Battle Royale: The Complete Collection, however they are all on disc four, which happens to be a DVD littered with standard definition content. Although not in high definition, the supplements are interesting and lengthy. The “Making Of” featurette lasts almost an hour and has plenty of behind the scenes footage. Also, there’s full length features in this one set, so that’s plenty of extra right there. Battle Royale: The Complete Collection is a no-brainer, especially with The Hunger Games on the scene. The chance to see some International cinema that influenced a significant piece of pop-culture is always a must. The four disc set is awesome and offers plenty of content. Battle Royale is a superior movie than the sequel, but that can be said for almost any film and its sequel. The presentations aren’t perfect, but if you were able to find this at a bargain price it’s still a deal. Action fans, Horror fans, and Asian Cinema fans should be all over this release.